Heinz baby food coupon is a printed coupon. You can visit SmartSource.ca’s website, select the Heinz baby food coupon and click on ‘Print Now’. You will be prompted to download the coupon printing software and then you can print the coupon. You can print the coupon twice from the same location. Bring in your printed coupon to any major retailer and they should accept your coupon. This is a Heinz coupon to buy any 128mL four (4) Heinz baby food pouches and get one free. Heinz baby food coupon is valid only in Canada. 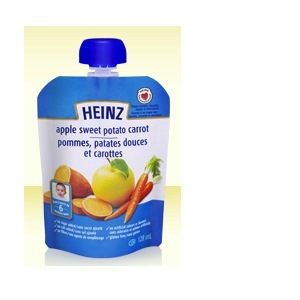 You can find Heinz baby food pouches 128 mL in any supermarket, grocery store, Walmart, Loblaws and more. Portable – This light and flexible format was designed with grab-and-go in mind. Re-sealable -The Pouch re-seals securely to maintain freshness and prevent spillage. Convenient -There’s no need for a bowl. Simply squirt food onto spoon and feed. Trusted – From smooth Banana Mango Yogourt to tasty Apple Pear Cinnamon, all Pouch Baby Foods are backed by the Heinz Purity Assurance program for your total peace of mind.